Learn how to cook spaghetti squash. If you want to know how to cook spaghetti squash, it is a very simple thing to do. Spaghetti squash is a healthier alternative to wheat pasta, and it counts as one serving of vegetables! Why not give this tasty veggie a try tonight? Many people enjoy spaghetti squash, but it you are not familiar with it, you might be wondering why it's named after the thin, stringy pasta. It's simple - once cooked, the flesh of the spaghetti squash can be scraped with a fork to reveal long, spaghetti-like "noodles." The squash strands go perfectly with your favorite pasta sauces without adding all of the extra carbs to your diet. Why not pick up a spaghetti squash instead of a package of pasta the next time you're at the store? It is very simple to select a good spaghetti squash. First, find a good-sized squash from your local grocery store or farmers market. Make sure it is solid and yellow all the way around, with no brown, mushy spots. The fruit should be heavy for its size, with good density. A perfect spaghetti squash will be about five inches in diameter and measuring eight to 10 inches in length. Preheat your oven to 350°F. Scrub the squash down with a vegetable brush just before you're going to cook it, then dry it completely. Split the squash in half length-wise, making sure both halves are about the same size so that they will cook evenly. Scoop out the seeds with a fork and discard. Place both squash halves face down in a jellyroll pan and add one cup of water to the bottom of the pan. Place the pan in the oven and roast for one hour, checking occasionally to make sure there is still water in the bottom of the pan. After one hour, check the squash and see if you can penetrate it with a fork. If it is still too hard, roast for another fifteen minutes. Once the squash is tender, remove it from the oven and allow it to cool for ten minutes. Now comes the fun part - turning the squash into spaghetti! Scrape the inside of the squash with a fork to release the string-like flesh into a bowl. Cover the squash ribbons with your favorite spaghetti sauce and enjoy hot. You don't need to prepare a spaghetti squash in the oven if you have a microwave. 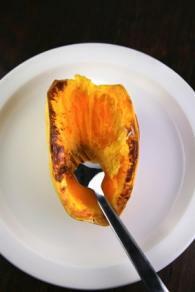 To prepare your squash in the microwave, cut it in half lengthwise and scoops out the seeds with a spoon. Place squash halves face down in a microwave dish with 1/4 cup water. Cover the dish with plastic wrap and cook on high for 10 to 12 minutes, until you can pierce the entire thing with a fork. Let stand covered for five minutes to cool before shredding the inside with a fork to release the spaghetti strands. Spaghetti squash can be your healthy dinner option when you don't want to pack on the carbs, but still want to enjoy your favorite sauce. What kind of sauce should you use on your squash? You can use anything that you like for regular pasta, such as marinara, meatballs, you name it! If you're confused about the process, here's a photo tutorial on how to clean, cook and scrape out a spaghetti squash. Looking for a great recipe? How about Moroccan Spices Spaghetti Squash? 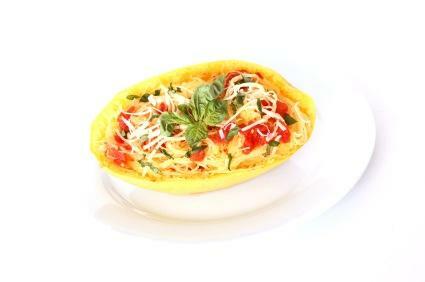 What vitamins and nutrients are in a spaghetti squash?